In 1917, a huge explosion rocked part of the eastern seaboard in the United States. The demolition of Nikola Tesla’s Wardenclyffe Tower marked the end of an early era in experimental electronics. The U.S government had declared the area a threat to national security and so the use of dynamite (invented by Alfred Nobel) was permitted. The official reason for the destruction of his greatest project was that such an obvious coastal feature could be used by enemy vessels as a handy landmark. Despite the height of the tower (almost 200 feet), this explanation isn’t satisfactory at all. It seems the U.S government was both jealous and frightened of Tesla’s technological claims. His work was of great militaristic use. His proposed instruments were, as he claimed, capable of causing total mayhem. His papers were therefore highly coveted. A few years previously, an explosion of unimaginable proportions sent shock waves throughout the entire south west of Scotland. The source of this disaster was found to be located on the desert-like peninsula known as Ardeer, the site chosen by Alfred Nobel for the establishment of a factory handling gunpowder, nitro-glycerine and dynamite. Alfred Nobel and Nikola Tesla are known to have communicated and it’s likely that both knew much about each other’s work. Tesla claimed, in 1902, that a secondary tower had been built in Scotland for the express purpose of powering up the planet. With the establishment of radio stations in New York and in an unknown location in Scotland, the electrification of the earth, one of Tesla’s greatest visions, could at last be realised. If his claim was genuine, it is safe to presume that his Scottish transmitter would at least serve mainland Britain. However, it is also possible that Tesla designed it to serve the entire continent of Europe, or possibly the entire northern hemisphere (in conjunction with the tower in the U.S.). His “vision” contained a number of remarkable predictions, most of which were said or written almost a century before they were realised. Innovations such as the internet, mobile telephony and the daily use of wireless downloads were among the most accurate. They are immediately familiar to us today. Unfortunately we still don’t know where the Scottish station was erected, or in fact if it was ever used. But there are a few indicators that it may have been located in or near Ayrshire and even more to connect Tesla with Scotland. 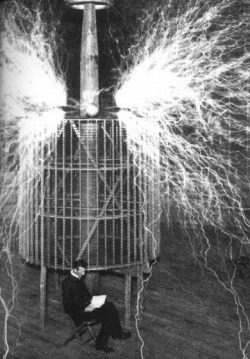 Tesla would occasionally communicate with the Scottish based physicist and inventor William Thomson. Thomson was initially reluctant to acknowledge the engineering efforts of his colleague across the pond. After a number of years however, he couldn’t help but give Tesla his due. Thomson later said that Tesla, “contributed more to electrical science than any man up to his time.” It’s quite an achievement to receive an appraisal such as this from one of the most eminent men in the history of science. Thomson’s Ayrshire connections are well known. He died in Largs, Scotland in 1907.